Clean toor dal thoroughly and soak in water for 15 minutes and pressure cook it with turmeric powder and enough water. Extract juice from tamarind by soaking it in warm water for some time. Heat oil in a pan; add chopped onion, green chillies, and curry leaves, fry for a while. Then add tomatoes, sorakkai and stir well. Now add chilli powder, coriander powder and salt along with 2 cups of water. Cook covered on low flame till the vegetables are tender. Once sorakkai is cooked add in cooked dal. Add tamarind juice, asafoetida powder, salt, Fenugreek seeds powder, cover it and boil in low flame for 15 minutes. Heat oil in a pan, add mustard, when they splutter throw cumin seeds, urad dal, dry red chillies and curry leaves. 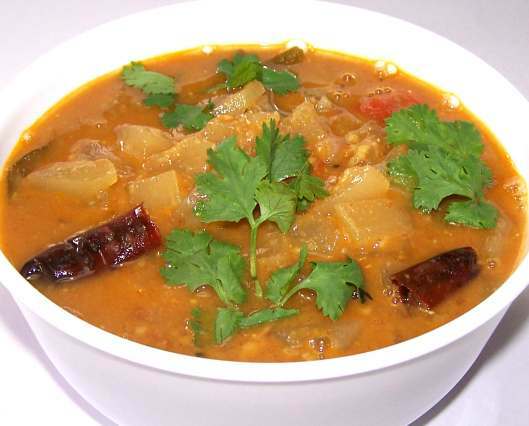 Pour the season to the sambar. Finally add some coriander leaves and serve warm with rice or idli.